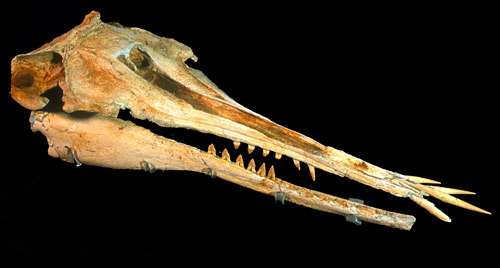 This skull of the extinct Dalpiazinid dolphin, found in the eastern South Island of New Zealand, is around 26 million years old. Its upper jaw is long and flat, and the front teeth point forward like tusks. This is the second finding of a member of this family; the first was in Italy. This item has been provided for private study purposes (such as school projects, family and local history research) and any published reproduction (print or electronic) is an infringement of copyright law. It is the responsibility of the user of any material to obtain clearance from the copyright holder.